Operation Respect is a cooperative public service program developed by Women In Mining and the Colorado State Office of the Bureau of Land management in 1977. 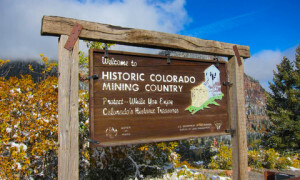 The program was established to form a bond between the past and the present, promoting individual safety and collective responsibility, while educating both Colorado citizens and out-of-state visitors regarding the continuing importance of mining. The picturesque remains of our past are historic monuments to several generations who came west and endured dangers and hardships in their quest for riches and a better life-style. It is our privilege to be able to observe these relics and to imagine the living conditions of those heroic men and women who toiled in the early mines and mining communities. At the same time, we are aware of the potential hazards which exist today in the old mining districts. OPERATION RESPECT emphasizes the importance of observing Mining Property Conduct while appreciating Colorado’s heritage. Knowledge of mining methods and recognition of mining structures can provide leisure-time visitors a safer experience when visiting private, state or federal lands throughout Colorado’s Mining Country. For these reasons, Women in Mining, the Bureau of Land Management, the Colorado Division of Mines, and their educational consultants provide these enrichment materials for use when studying Colorado’s historical past. Teachers are encouraged to reproduce any or all parts of this calendar, utilize the Teacher Resources at the back, and to display the calendar so students may enjoy the daily historical dates and the “Did you know?” facts listed each month.